Mernet Larsen, Misstep, 2015. Acrylic and mixed media on canvas, 50 x 60 inches. James Cohan is pleased to present Things People Do, the gallery’s first solo exhibition of work by Mernet Larsen. The show will be on view from January 22 through February 21 at the gallery’s Lower East Side location, with an opening reception on Friday, January 22 from 6 to 8pm. Mernet Larsen’s paintings are simultaneously rooted in and distant from reality. Taking inspiration from the geometric abstractions of El Lissitzky and the narrative stylization of 12th-century Japanese and early Renaissance paintings, Larsen’s vertiginous spaces often rendered in reverse perspective, and hard edged figures offer familiar versions of reality that are analogous and parallel to our own. Mernet Larsen has recently been the subject of solo exhibitions at Various Small Fires, Los Angeles (2015), and Johannes Vogt, New York (2012). In 2016, Larsen was selected to be included in Phaidon Press’s forthcoming edition of the “Vitamin P: New Perspectives in Painting” series, to be published this fall. Reviews of her work have also appeared in Mousse Magazine, Artforum, The New York Times, Hyperallergic, ArtReview, and The LA Times. Additionally, her work is housed in many significant collections, including The Walker Art Center, Minneapolis; Los Angeles County Museum of Art; Zabludowitz Collection, London; Levy Collection, Paris; Ringling Museum of Art, Sarasota, Florida; and the Tampa Museum of Art, Florida. 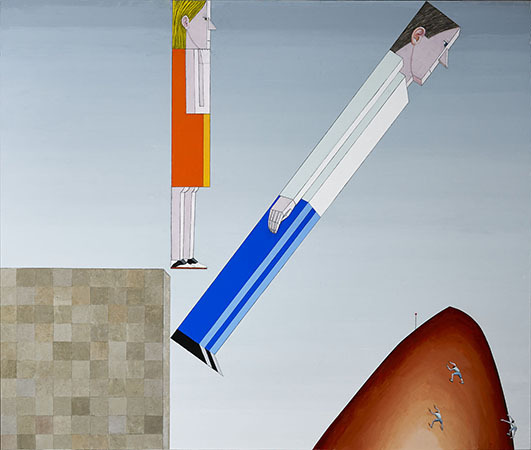 Since the late 1970s, Larsen has exhibited extensively in Florida, having over 30 solo exhibitions, including career retrospectives at the DeLand Museum of Art, Florida (1992), and the Morean Art Center, St. Petersburg, Florida (2010). In addition, Larsen has been part of over 70 group shows including Sadie Coles HQ and White Cube in London, the National Museum of Women in the Arts in Washington D.C., and the American Academy of Arts and Letters, Regina Rex, the New York Studio School Gallery and Lisa Cooley in New York City. For press inquiries, please contact Jeffrey Waldron at jwaldron [​at​] jamescohan.com or T +212 714 9500. For other inquiries, please contact Allison Galgiani at agalgiani [​at​] jamescohan.com or T +212 714 9500.